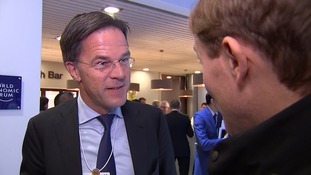 The Dutch prime minister spoke to Business and Economics Editor Joel Hills at the World Economic Forum in Davos. The comedy skit reflects an uncomfortable truth - which is that the Government has not yet decided on our EU future trading relationship. Trump will attempt to argue that his nationalist agenda will be good for the world as well as America. US President Donald Trump has said he expects trade between the US and UK to "increase many times" over the coming years. The Prime Minister has her eye on foreign investment and trade deals, post-Brexit, and this is a very good place to make her pitch. In unguarded comments, Mr Cameron can be heard saying: "It turned out less badly than we first thought. But it's... going to be difficult." The World Economic Forum is making a push for greater equality - but how will that sit with a visit from the UK President? With Donald Trump and Elton John the headliners, Joel Hills explains why this year's ski resort power talks are set to get interesting. The chairman admitted that "we were all wrong" about the resilience of the economy. The prime minister was talking during her first visit to the World Economic Forum in Davos, adding she was confident banks would not leave.